We’ve often been puzzled why some recipes specifically call for vegetable oil while others call for olive oil. Monounsaturated fats (can help reduce bad cholesterol levels in your blood which can lower your risk of heart disease and stroke. They also provide nutrients to help develop and maintain your body’s cells. Oils rich in monounsaturated fats also contribute vitamin E to the diet). Antioxidants (powerful substances, which mostly come from the fresh fruits and vegetables we eat, prohibit (and in some cases even prevent), the oxidation of other molecules in the body. The benefits of antioxidants are very important to good health, because if free radicals are left unchallenged, they can cause a wide range of illnesses and chronic diseases. Good olive oils also have a pleasant flavour and aroma that compliment many dishes. 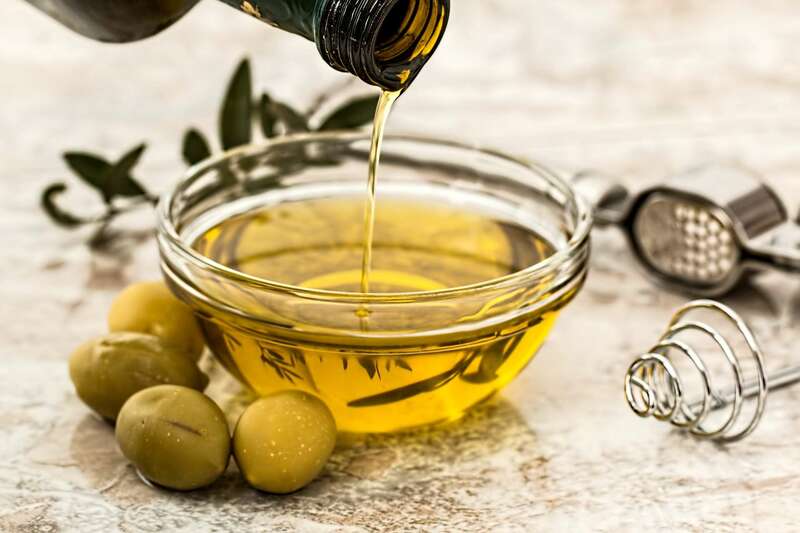 However, olive oil has a relatively low smoke point (325-375°F/165-190°C), making it less ideal for cooking methods requiring high heat like pan-searing and high-heat stir fries. Vegetable oil is extracted from seeds like the rapeseed (canola oil) soybean (soybean oil), corn, sunflower, safflower, which requires chemical processes that will allow them to be extracted and so it can have a higher smoke point, better for high-temperature cooking. These chemical processes are known for being bad for your health. It’s certainly nothing like the simple processes used to make other popular fats/oils, like butter, olive oil or coconut oil. The mere fact that it is exposed to high heat should turn you away from this oil. It is high in polyunsaturated fats (Omega-3 and omega-6 can help reduce bad cholesterol levels in your blood which can lower your risk of heart disease and stroke), which are very sensitive to high heat and easily become oxidized (rancid). One study analysed canola and soybean oils found on store shelves in the U.S. They found that 0.56% to 4.2% of the fatty acids in them were toxic trans fats (raise your bad (LDL) cholesterol levels and lower your good (HDL) cholesterol levels. Eating trans fats increases your risk of developing heart disease and stroke. It’s also associated with a higher risk of developing type 2 diabetes and can mainly be found in processed food, because oils with trans fats can be used many times in commercial fryers). Till today, only three EU Member States adopted legislation to restrict industrially produced trans fats in the food chain, being Denmark the first one, followed afterwards by Austria and Hungary. In summary: Even though they are both high in calories, olive oil has more natural ones then vegetable oil. And being healthier, means more price. As a tip to help you save money, you can always use any olive oil that comes in jar with olives, tomatoes, artichokes, etc. as a great salad dressing or storage it in jars for a short period of time. Thanks so much reading this post. If you liked this post, you might like Struggle! Drinking 8 Glasses of Water A Day , Hay Fever and Sweets accelerate skin aging.